Small stream, Utah, USA. 04 Apr 2017. Sergei Shalygin. © Creative commons. Winthrop, Washington, US.... 15 Jan 2011. Karl Bruun. © Karl Bruun. Winthrop, Washington, USA; Methow River, Lugols, 1000x DIC. 15 Jan 2011. Karl Bruun. © Karl Bruun. 600x __Dim. 43 x 117 µm. 02 Apr 2011. Robert Lavigne. © Robert Lavigne. (MicroscopyView.com). Winthrop, Washington, USA; Methow River, 400x, DIC. 19 Jan 2010. Karl Bruun. © Karl Bruun (skogenman@earthlink.net). Winthrop, Washington, USA; Methow River, Audubon Trail bridge, 400x DIC. 20 Jan 2009. Karl Bruun. © Karl Bruun (skogenman@earthlink.net). Mararoa River, Southland, New Zealand; dead dry plants. © Free of copyright. Scanning electron micrograph of the silica cell wall. The raphe is composed of the two slits that run along the apical axis of the cell. The cell secretes mucopolysaccarides through the raphe .. Sarah Sapulding. © Public domain. Published in: Schmidt, A.[W.F.] (1899). Atlas der Diatomaceen-kunde. Series V: Heft 54: pls 213-216 [M. Schmidt]. . Leipzig: O.R. Reisland . 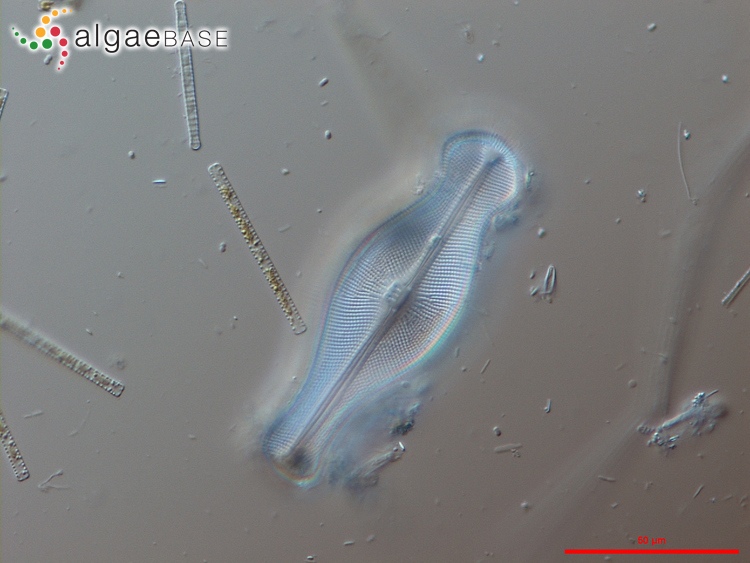 This is the type species (holotype) of the genus Didymosphenia. in ins. Faer. ad saxa rivulorum subalpest. prope Argehospital et rupem Skielling [Faroe Islands] (Lyngbye 1819: 219). Bąk, M., Witkowski, A., Zelazna-Wieczorek, J., Wojtal, A.Z., Szczepocka , E., Szulc, A. & Szulc, B. (2012). Klucz do oznaczania okrzemek w fitobentosie na potrzeby oceny stanu ekologicznego wód powierzchniowych w Polsce Biblioteka Monitoringu Srodowiska. pp. 1-452. Warszawa [Warsaw]: Glowny Inspektorat Ochrony Srodowiska. Cantonati, M., Kelly, M.G. & Lange-Bertalot, H. (2017). 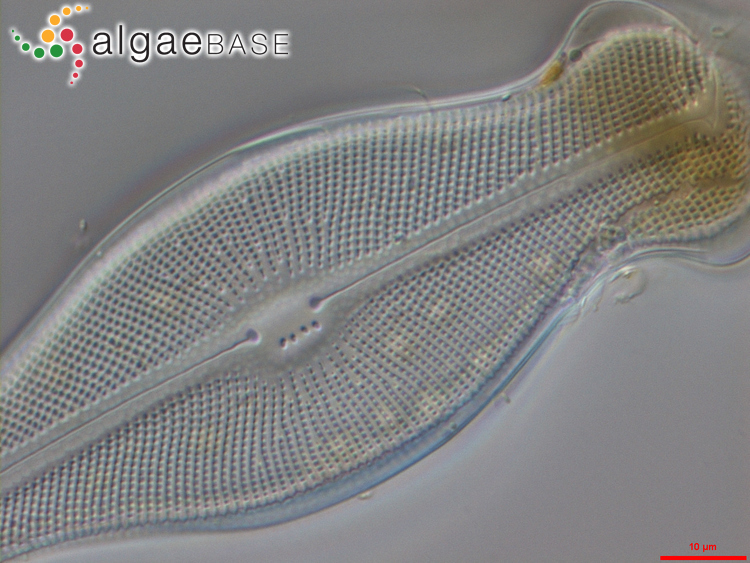 Freshwater benthic diatoms of Central Europe: over 800 common species used in ecological assessments. English edition with updated taxonomy and added species. pp. -942, 135 pls. Schmitten-Oberreifenberg: Koeltz Botanical Books. Dawson, P.A. (1973). The morphology of the siliceous components of Didymosphenia geminata (Lyngb.) M. Schm.. British Phycological Journal 8: 65-78, 40 figs. Hofmann, G., Werum, M. & Lange-Bertalot, H. (2013). 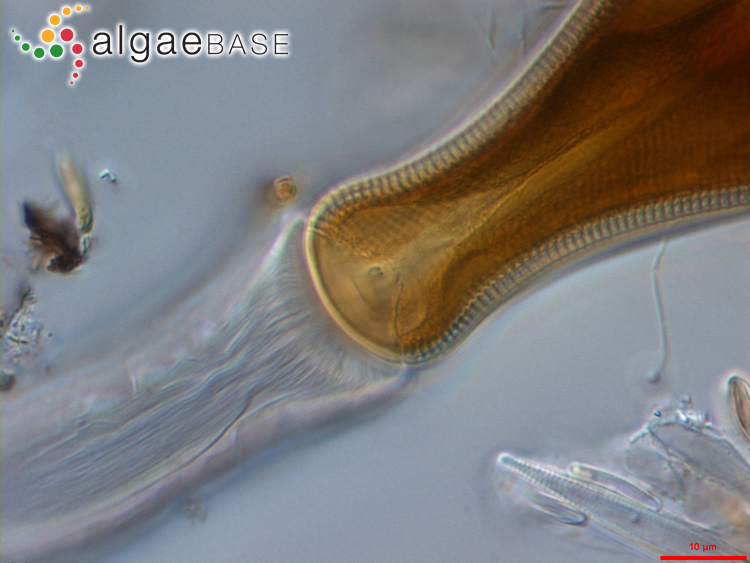 Diatomeen im Süßwasser—Benthos von Mitteleuropa. Bestimmungsflora Kieselalgen für die ökologische Praxis. Über 700 der häufigsten Arten und ihre Ökologie. pp. -908, 133 pls. Königstein: Koeltz Scientific Books. Hustedt, F. (1930). Bacillariophyta (Diatomeae) Zweite Auflage. In: Die Süsswasser-Flora Mitteleuropas. Heft 10. (Pascher, A. Eds), pp. [i]-vii, -466. Jena: Verlag von Gustav Fischer. Kermarrec, L., Ector, L., Bouchez, A., Rimet, F. & Hoffmann, L. (2011). A preliminary phylogenetic analysis of the Cymbellales based on 18S rDNA gene sequencing . 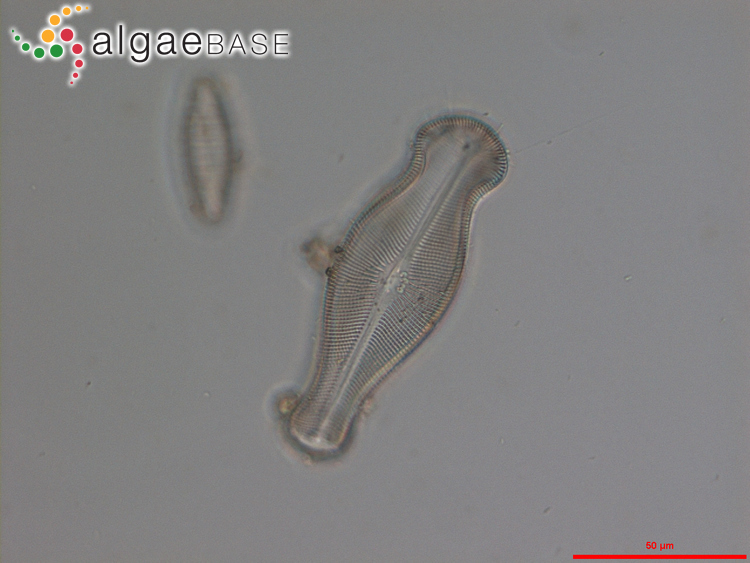 Diatom Research 26(3): 305-315. Khan-Bureau, D.A., Morales, E.A., Ector, L., Beauchene, M.S. & Lewis, L.A. (2016). Characterization of a new species in the genus Didymosphenia and of Cymbella janischii (Bacillariophyta) from Connecticutt, USA. European Journal of Phycology 51(2): 203-216. Krammer, K. & Lange-Bertalot, H. (1986). Bacillariophyceae 1 Teil: Naviculaceae. In: Süßwasserflora von Mitteleuropa. Begründet von A. Pascher. Herausgegeben von. H. Ettl, J. Gerloff, H. Heynig & D. Mollenhauer. Band 2/1. pp. [i]-xvi, -876, 206 pls with 2976 figures. Stuttgart & New York: Gustav Fischer Verlag. Metzeltin, D. & Lange-Bertalot, H. (2014). The genus Didymosphenia M. Schmidt. A critical evaluation of established and description of 11 new taxa. Iconographia Diatomologica 25: -293, 126 pls. Sims, P.A. (ed.) (1996). 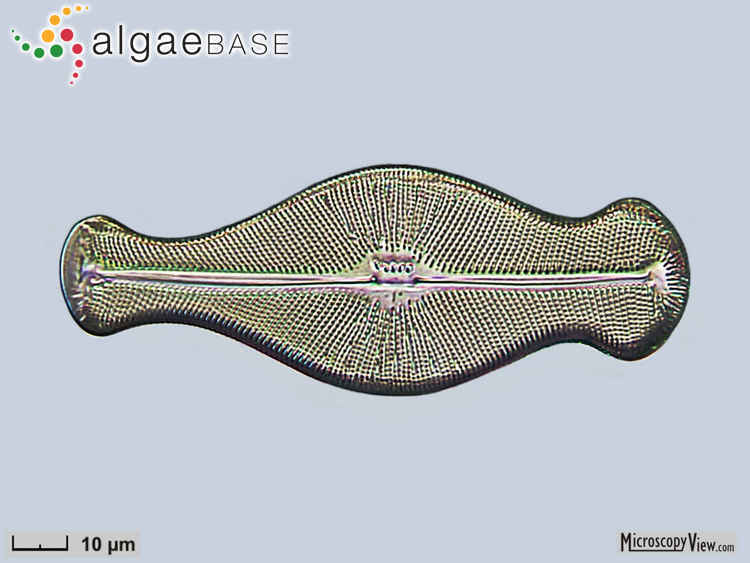 An atlas of British diatoms arranged by B. Hartley based on illustrations by H.G. Barber and J.R. Carter. pp. , 1-601, incl. 290 pls. Bristol: Biopress Ltd.
Snoeijs, P. & Balashova, N. (1998). Intercalibration and distribution of diatom species in the Baltic Sea The Baltic Marine Biologists Publication No. 16e. Vol. 5 pp. 1-144, 1 fig, 6 tables, 101 plates. Uppsala: Opulus Press. Accesses: This record has been accessed by users 18534 times since it was created. Antoine, S.E. & Benson-Evans, K. (1984). Morphological variation in six populations of Didymosphenia geminata (Lyngbye) M. Schmidt of Great Britain. Nova Hedwigia 40: 141-156. Antoine, S.E. & Benson-Evans, K. (1983). Polymorphism and size variation in Didymosphenia geminata from Great Britain. British Phycological Journal 18: 199-200. Beamud, S.G., Baffico, G., Reid, B., Torres, R., Gonzalez-Polo, M., Pedrozo, F. & Diaz, M. (2016). Photosynthetic performance associated with phosphorus availability in mats of Didymosphenia geminata (Bacillariophyceae) from Patagonia (Argentina and Chile). Phycologia 55(2): 118-125. Bergey, E.A., Desianti, N. & Cooper, J.T. (2017). Characterization of the diatom flora in the Lower Mountain Fork (Oklahoma, USA), a novel regulated river with a disjunct population of the diatom Didymosphenia geminata (Bacillariophyta). European Journal of Phycology 52(2): 225-237. Bishop, I.W. & Spaulding, S.A. (2017). Life cycle size dynamics in Didymosphenia geminata (Bacillariophyceae) . Journal of Phycology 53(3): 652-663. Blanco, S. & Ector, L. (2009). 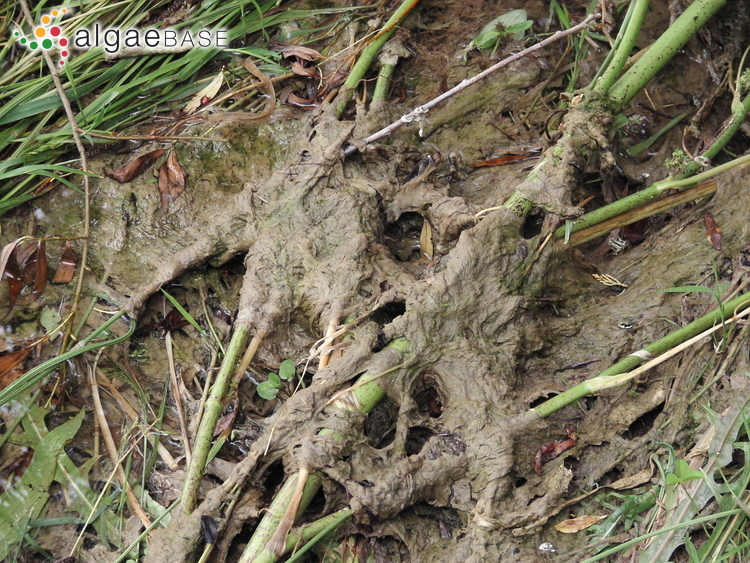 Distribution, ecology and nuisance effects of the freshwater invasive diatom Didymosphenia geminata (Lyngbye) M.Schmidt: a literature review. Nova Hedwigia 88: 347-422. Kawecka, B. & Sanecki, J. (2003). Didymosphenia geminata in running waters of southern Poland - symptoms of change in water quality?. Hydrobiologia 495: 193-201. Kilroy, C. & Bothwell, M. (2011). 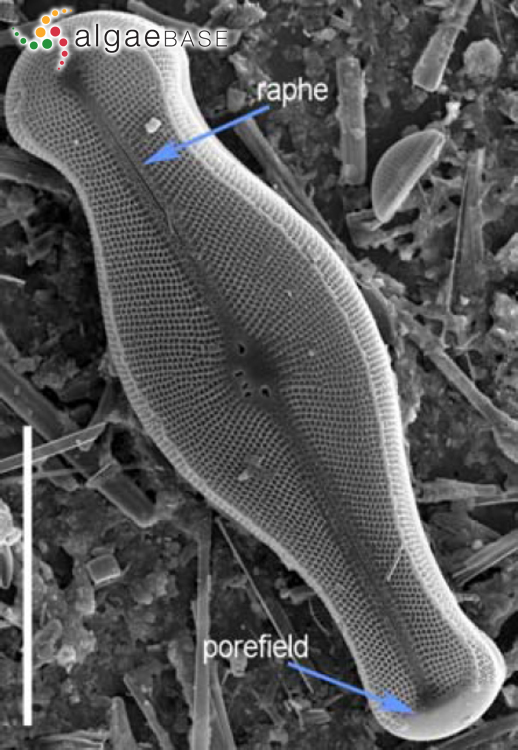 Environmental control of stalk length in the bloom-forming, freshwater benthic diatom Didymosphenia geminata (Bacillariophyceae). Journal of Phycology 47(5): 981-989. Kilroy, C. (2004). 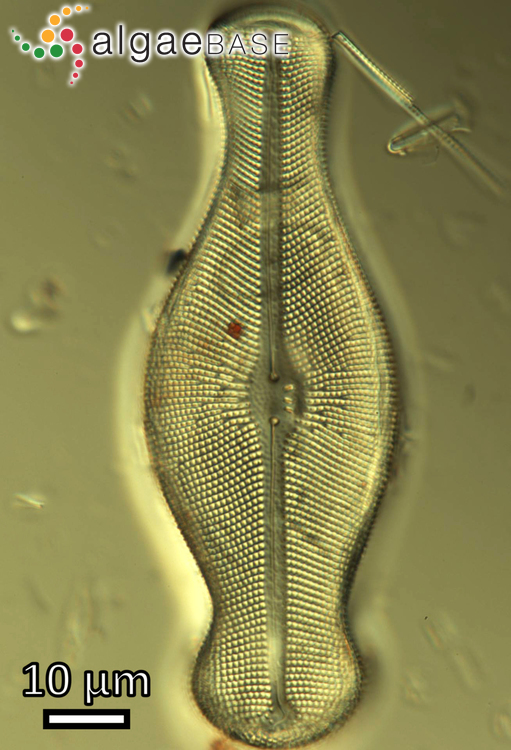 A new alien diatom, Didymosphenia geminata (Lyngbye) Schmidt: its biology, distribution, effects and potential risks for New Zealand fresh waters. pp. 1-40. Christchurch: National Institute of Water & Atmospheric Research Ltd. Report No. : NIWA Client Report: CHC2004-128. Kuhajek, J.M., Lemoine, M., Kilroy, C., Cary, S.C., Gerbeaux, P. & Wood, S.A. (2014). Laboratory study of the survival and attachment of Didymosphenia geminata (Bacillariophyceae) in water sourced from rivers throughout New Zealand. Phycologia 53(1): 1-9. Sanmiguel, A. Blanco, S., Álvarez-Blanco, I., Cejudo-Figueiras, C., Escudero, A., Pérez, M.E., Noyón, G. & Bécares, E. (2016). Recovery of the algae and macroinvertebrate benthic community after Didymosphenia geminata mass growths in Spanish rivers. Biological Invasions 18(5): 1467-1484. Sherbot, D.M.J. & Bothwell, M.L. . (1993). Didymosphenia geminata (Gomphonemaceae). A review of the ecology of D. geminata and the physicochemical characteristics of endemic catchments on Vancouver Island. Saskatoon, Saskatchewan: National Hydrology Research Institute, Environment Canada. Report No. : NHRI Contribution No. 93005. Spaulding, S.A. & Elwell, L. (2007). Increase in nuisance blooms and geographic expansion of the freshwater diatom Didymosphenia geminata. U.S. Geological Survey Open-File Report 1425: 1-38, 19 figs. Stoermer, E.F., Yu-Zao, Q. & Ladewski, T.B. (1986). A quantitative investigation of shape variation in Didymosphenia geminata (Lyngbye) M. Schmidt (Bacillariophyta). Phycologia 25: 494-502. Zglobika, I., Chlanda, A., Wozniak, M., Lojkowski, M., Szoszkiewicz, R., Mazurkiewicz-Pawlicka, M., Swieszkowski, W., Wyroba, E. & Kurzydlowski, k.J. (2017). Microstructure and nanomechanical properties of single stalks from diatom Didymosphenia geminata and their change due to adsorption of selected metal ions. Journal of Phycology 53(4): 880-888.